Deb Salvagno works for the East Timor Women’s Association, which runs tours of the Lautem district in East Timor, where traditional weaving flourishes. They also are involved in broader community development including health and education. Here she answers questions about the nature of this exchange between those inside and outside East Timor. It’s particularly interesting to read her reflection on fulidai-dai, the local gift economy that supports the transmission of craft skills. What do you think is special about the craft produced in the Lautem district of East Timor? 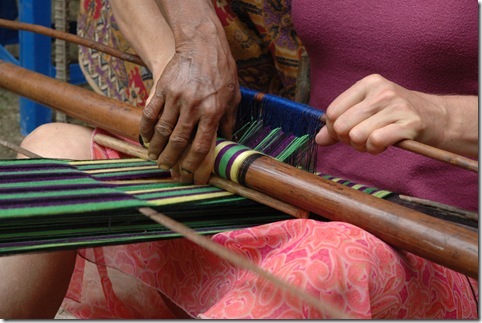 The predominant craft medium we work with is traditional hand-woven cloth known as tais. All over the island of East Timor, tais are signifiers of ethnicity, and designs are specific to language groups. They contain motifs that are a symbolic dialogue of diverse cultural practices. Even when the motifs cannot be associated to culture, they usually represent something more than decoration. The women we work with live in remote communities in the south east corner of the island; in the flatlands of Los Palos and the densely forested highlands of Iliomar. Los Palos is home to the Fataluku people. Tais woven by weavers in this community utilise futus (ikat) dyeing methods to express their ancestral heritage. Fataluku tais are revered and valued highly in traditional exchange. In Iliomar, weavers from the Makalero people use a combination of floating warp techniques to create rows of a unique and dainty floral motif. Usually presented in white on red or brown back cloth, these motifs have their origins in colonial exchange with the Portuguese who first came to East Timor in the middle ages. Iliomar weavers also utilise futus dyeing methods, however the European inspired floral motif is unique to this area of East Timor. Fataluku tais are more valuable locally than the Iliomar tais as the relationship between these two communities are steeped in ancient pacts and power relations. Learning about the anthropology of cloth consumption and how the consolidation of social relations and specific cultural values are expressed through tais has been an amazing learning journey for me personally. By the commercial application of the traditional skills used to create tais, the women we work with hope to safeguard their traditions while simultaneously easing the disadvantages of poverty; this area of this craft practice is extraordinary and presents great potential. Do they need help? What kind and why? Product design and quality control are two one of the many areas where artisans in East Timor need our assistance. As cloth is created for tradition rather than for markets, product should integrate and balance both the cultural distinctiveness of the cloth and commercial application of the women’s skills. ETWA works with the Cooperative for Tais and Cultural Development (CTCD), which has 86 female members drawn from three weaving collectives in Iliomar and Los Palos. These women come from the poorest and most disadvantaged families in the region; approximately 25% of female members were widowed during the Indonesian occupation, literacy is low and many members have limited access to farmlands. The coop is attempting to deal with the challenges presented by independence- and the challenges are many. The cost of everything is rising; imported cotton has risen by approximately 150% in the past twelve months. Many women are desperate for cash so they underprice their weavings and often they’re losing money as well as hours of back-breaking work. Clearly this is making them poorer, so it’s not surprising that paying for life’s necessities is a major challenge. While income is generated through weaving tais and transforming it into soft fashion accessories such as bags, as one south-east Asia’s least developed countries, the design and quality of their finished product is low-grade. Developing international markets is vital as the domestic market for weavings is inadequate, however, until product design and quality improves, prospects for increasing market share are minimal. The back strap weaving technique also produces textiles that are as varied and unique as the women who produce them, so improving consistency of output is important. The imported cotton yarn available in East Timor is intended for commercial use and the colour range and quality are substandard. We are hoping that with assistance from the Australian design community, we can support the communities in Iliomar and Los Palos to begin growing high grade cotton locally and thereby replace the need for imported cotton. Through this process, we will increase local cash flows, improve product quality and help artisans to maintain their dyeing traditions as the colours of traditional tais are exquisite. As we take a holistic approach to our work, we are also looking to improve the women’s health and will undertake research in June this year. We’re excited about the possibilities this will open for the weavers. Can they help us? Can you explain what Fulidai-dai is? CTCD’s organisational model is based on the cultural notion of Fulidai-dai; a concept unique to the Makalero people of Iliomar. It is a set of cultural norms that govern relationships towards reciprocity, mutual exchange and collective support. The practice of Fulidai-dai encourages cooperation and puts the focus on supporting one another rather than encouraging individualism and competition. Through Fulidai-dai, groups work in reciprocity for the greater good of their community, such as working together in the fields, building houses, looking after children or caring for community members when they are sick. The notion of Fulidai-dai also encourages the passing on of wisdom, so when women share their knowledge of traditional arts with younger women, they are practicing Fulidai-dai; it ensures that cross-generational and cross- gender cooperation and sharing occurs. By integrating the notion of Fulidai-dai which encourages collective decision making, common ownership, consultation and member participation, CTCD has developed a culturally appropriate business model. Unlike the state and privately-owned cooperatives that operated in East Timor during the Indonesian occupation, the principles of Fulidai-dai are similar to -yet run deeper than- the principles of International cooperatives. In the west, many people feel we have lost the deep sense of connectedness and community that the people of East Timor share so there is much we can learn. Mutuality, cooperation, patience, loyalty and the essence of friendship are just a few of the ways of being that we can learn from the weavers in Iliomar. And of course the things we learn are equally as important as the gift of support we bring. Acknowledging Fulidai-dai as a legitimate and honourable practice rather than imposing a business model appropriate to our culture, is another way we can support the women to use cultural traditions to build new futures for their communities. If inclined, we can bring these notions back to Australia to help regenerate community here. Where would you like to see the partnership between them and us continue in the future? In East Timorese society, the practice of giving and exchanging helps to maintain harmony within communities. If we perceive our work with CTCD in this light, we acknowledge that we both give and receive and we recognize that when two cultures join together in recognition of what each can bring to the other, endless possibilities are created. We aim that our partnerships continue this way on a road towards empowerment for both the East Timorese women we work with and for our members and supporters in Australia. Our annual weaving tour is an example of this. The tour gives participants an opportunity to learn about traditional weaving and dyeing through a series of participatory workshops and East Timorese weavers receive an opportunity to express their craft. On a more practical level, we aim to work with communities to build a central space for research, design, product development and training and a place of mutual exchange where the International design community can exchange skills with East Timorese artisans in Lautem. We recognize that what we as Australian women bring to the relationship is access to resources and to markets to help give CTCD members access to the things they need to improve their quality of life. Deb Salvagno has a background in the rag trade and has a BA in Community Development. She has worked in East Timor since 2003 and is a volunteer with East Timor Women Australia.